An article by an American reporter alleged that the U.S. embassy in Jakarta played a role in the Indonesian massacres of 1965-1966 by supplying a list of known communists to Major General Suharto (seen right), whose forces then hunted them down and killed them. The violence began when Communist forces killed six of Indonesia’s senior army officers on October 1, 1965. 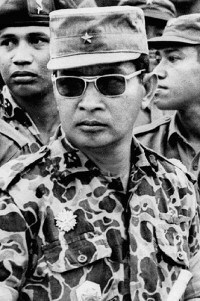 In response, army forces under the command of Suharto began a campaign to rid Indonesia of the communist party (Partai Komunis Indonesia or PKI) and other leftist organizations. The purges and ensuing civil war left an estimated half-million people dead. President Sukarno remained in power for six more months before being ousted by Suharto. In her May 19, 1990 article “Ex-agents say CIA compiled death lists for Indonesians,” Kathy Kadane of States News Service asserted, “U.S. officials acknowledge that in 1965 they systematically compiled comprehensive lists of Communist operatives, from top echelons down to village cadres. As many as 5,000 names were furnished to the Indonesian army, and the Americans later checked off the names of those who had been killed or captured.” The article, published in The Washington Post and other dailies, was refuted by New York Times reporter Michael Wines, who examined transcripts of Kadane’s interviews for inconsistencies and spoke to her sources. In his September 1991 interview with Charles Stuart Kennedy, the primary subject of the article, Robert J. Martens, provided his view on the Indonesian genocide. The time period was also covered in the 2015 documentary The Act of Killing, which was nominated for an Academy Award and won a BAFTA for best documentary. Read more about Indonesia, coups and massacres, and to read the account of U.S. pilot Allen Pope, whose aircraft was downed as he carried out attacks against the Indonesian military. MARTENS: [Cultivating and maintaining] contacts were extremely difficult before the coup, very much like Eastern Europe; not quite that bad because there were people who were still brave enough to see Americans occasionally. Also, you had a fairly small elite, which was usually the case in Third World countries. Everybody seemed to know each other within the elites of a particular country. So you could sometimes know relatives of political figures who were not quite as political, as one example. There were various possibilities for some personal contact but it was very difficult. The great part of my reporting on the Indonesian Communist Party, its various affiliates, and some of the other left-wing movements – 99 percent of that — was based on reading the tea leaves of the communist press, and analyzing what was happening in the public arena. I did seek contacts and attend events whenever I could. 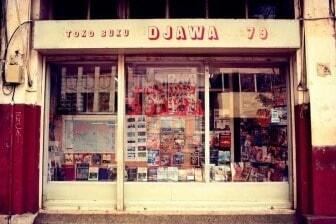 I went to the communist bookstores about once a month or so. I took advantage of any luck. I remember one time when the Embassy received by mistake an invitation from the Communist Party Central Committee to a PKI event. This was obviously a circular invitation intended for communist countries only, but some little PKI clerk had made a mistake. In fact, a colleague in the embassy and myself were the only two foreigners that showed up. The PKI leadership initially assumed we were Soviets but we didn’t say at any time that we were Soviets or Eastern Europeans, or anything else. We just appeared with the invitations. I was sitting directly behind [Dipa Nusantara] Aidit, the head of the PKI, in the second row and he was in the front row. A member of the Central Committee, a little bit to the left of us in our row, spoke to my colleague whose Indonesian was very good. My colleague had had about seven or eight years of association with Indonesia at that point. After they had talked for a while, this Central Committee member asked, “Where are you from?” expecting to hear Tomsk or Omsk or something, and my colleague said, “I’m from the American embassy.” Once we were asked, we had no intention of concealing our identity. The Indonesian’s jaw dropped, he stammered a little, and then he got up and went to the rear of the room. When he reached the rear of the room he spoke to somebody — we turned around and saw him do this — and then the third party wandered around but eventually reached the front row where he whispered into Aidit’s ear. Aidit didn’t know what to do either, so he spoke to the number two and number three in the PKI leadership, who were Lukman and Nyoto. All three then turned around and looked at us, then they turned around and they still didn’t seem to know exactly how to handle this unexpected situation. They finally talked some more, and then they finally went off to another part of the room. They didn’t throw us out, and we listened to the speech, which was a very anti-American speech incidentally, and then we left. 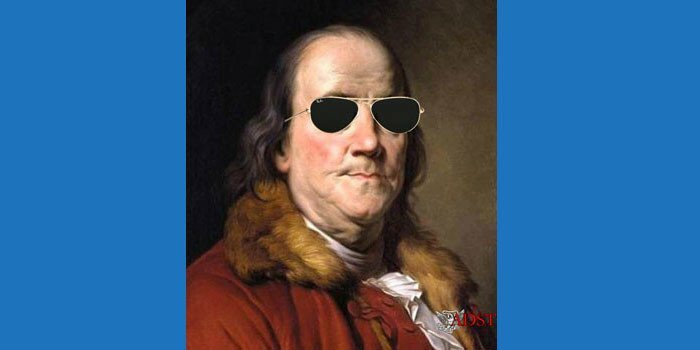 Anyway, we were fairly aggressive at times in pursuing a better understanding, a better knowledge of the country, but not really underhandedly; we had an excuse to do it on this occasion. Otherwise it was very difficult and the embassy was very isolated by the intense anti-American atmosphere promoted by both the Sukarno Government and the PKI. Before the September 30 affair [the killing of the generals began that night], I had developed one very good contact. This was a man who had stood up to the pro-communist course in the Foreign Ministry. He was probably also the only real Soviet and Eastern European expert in the Foreign Ministry. And he said, “Bob, as long as I live I’m going to be a free man. I’m going to associate with whom I want to, and talk with whom I want to, and if you don’t come to see me, I’ll come to see you. So you might as well come to see me.” And he did continue that contact. After the September 30 affair, he, I think, was a fairly prominent player behind the scenes. He was the brother-in-law of one of the key generals. I learned from another source that there was going to be an attempt to assassinate him. I remember this particular night. It was absolutely black, no light in the sky, no starlight, no moonlight. After I heard this information, I tried to go to his house, which was about eight or ten blocks away along dirt streets. 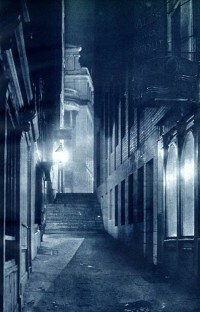 I knew the way well enough that I could haltingly find my way at say 2:00 or 3:00 in the morning. When I got to his house to warn him, I saw his wife. She was appreciative of the fact that I had come but she said her husband had already received a similar warning earlier in the day and had gone to stay with her brother, the general. So this was indicative of our relationship. This man remained a very good contact who became knowledgeable of developments and thinking, at the very top levels of the emerging anti-communist leadership. He also became a close advisor to [Adam] Malik as well [journalist and political figure, who at that time was “Minister for Implementation of a Guided Economy”], so I accordingly had two good contacts, and friends, who were close associates of Malik. And there were other contacts as well, so I began to develop a pretty good group of contacts — frankly, more than anybody else in the embassy had by a substantial degree in that early period of divided power when Sukarno remained after the coup, and Suharto was reluctant to replace him. Well, I knew all those people and it was a very close knit group — the entire mission — all elements at that embassy, particularly as the situation got worse and worse. In certain closed societies you tend to have better relationships with people, I think, than you do in some of the more open societies, so we knew all those people. They did a certain amount of reporting. It was the kind of reporting that the Agency does. In other words, non-analytical reports from sources, it was reporting on what the people they had on their payroll were saying, some of it was very good, some of it was off-base because a lot of the Indonesians were so terrorized by the flow of events that they came up with rosier views than were warranted, or that they really believed themselves. They kept hoping that Sukarno was going to save them from the communists, that kind of thing. Whether the CIA was doing anything operational, I don’t know. I don’t think they were doing anything substantial, frankly. The CIA, from all I’ve read or heard, had been involved in the earlier late 1950s conflict between the Outer Islands and Jakarta. 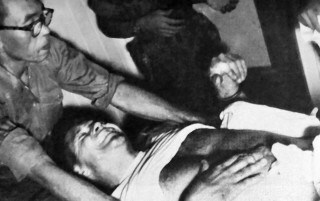 You may recall that an American pilot [Allen Pope, left] was shot down in Indonesia, and he apparently had a CIA connection. This was followed by the Jones period, when there was a considerable shift of U.S. policy [Howard P. Jones was U.S. ambassador to Indonesia from 1958-1965.] Jones had been sent out as someone very sympathetic to Indonesia and Sukarno and with a mandate to make sure that nothing like this went on. And the Agency, from all I was told by them and by others, was authorized to oppose the communists, narrowly defined, but to do nothing against Sukarno or any elements of the government. If you took the view, as I did, that Sukarno was the real leader of the PKI in essence, this was a totally unworkable kind of thing. So I don’t think that they — they certainly were not doing anything against Sukarno — and were doing anything else in a major way other than reporting. I don’t think, in any event, that one could find any basis whatsoever for any belief that the U.S. was involved in trying to change things in Indonesia. We wanted things to change. Obviously our sympathies were not with the communists, were not with Sukarno as he became identified with the communists, but that was all it was. We didn’t see any role to be played. And in fact, one could argue whether that was right or wrong, but that was basically our policy. We stayed out of it. Ambassador Green in his book [Indonesia: Crisis and Transformation, 1965-1968] describes how the policy under him was similar to that of a surf boarder riding the waves, keeping out of trouble basically. The changes that took place were changes that took place because of internal factors. 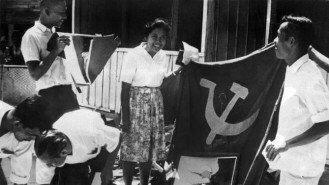 The fact was that the Indonesian people by this time were absolutely fed up with the Sukarnoist and PKI system; very much like what happened in more recent times in the Soviet Union and Eastern Europe. There are a lot of parallels. I might say that I’d had previous experience in Moscow, and at the height of the Cold War in the ’50s I found the terror in Indonesia in 1963 through 1965 greater than that in the Soviet Union. People were actually scared to death. I remember a young man who had been teaching me Indonesian on Sundays. The last time I saw him he went out the front gate and came running back to my porch saying that he had seen some people laying for him out there who were trying to kill him. I took him out the back way, and walked him up to a bus stop some distance in the opposite direction so I could protect him as far as I could. But there was obviously no way that I could protect him on a longer-term basis. I never saw this young man again even though I had offered to help put him through college the next year. 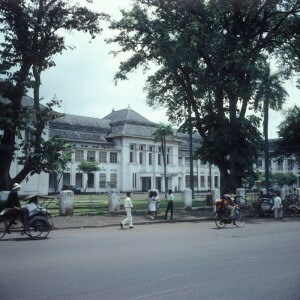 I had done so because the rupiah cost at our exchange rates were such that it wouldn’t cost me very much — perhaps $100. After the changes that occurred in a non- communist direction, you would have thought that this young man would have showed up again. He did not. I’m convinced that he was killed by the communists shortly after he left my house although I have no direct proof. And I had some very similar experiences with a professor at the University of Indonesia (seen left) that I used to see during my first year in Jakarta. Later he was intimidated by the communists at an academic symposium and his life was threatened if he continued to advocate non-communist views. He became so fearful thereafter that he wouldn’t see me anymore. What happened was, as in every closed society, people that have had the kind of experience I’ve had with Soviet affairs, analysis sometimes called Kremlinology, you try to read the tea leaves and you try to understand the organization of the communist party, not through contacts, which you cannot very much have, but through reading the communist press very carefully. One of the things you do is to try to form a structure of the party by carding the names of positions. Not so much the names, as to try to get the positions organized and understand how everything fits together. So I’d been doing that for the previous two years when this so-called coup, actually an attempted purge, took place. I had assembled all this unclassified data on the Communist Party structure based on the communist press itself and to a far lesser extent on other communist publications. Regarding the latter, I used to go to the three communist bookstores that I knew of in Jakarta from time to time and bought some of their pamphlets which I reviewed later. Anyhow, I developed this into a sort of structure of the party. About a month after the coup, a man came to my house — maybe this was two or three weeks afterward — who was a chief aide to Adam Malik (seen right), a man I have spoken of earlier. Malik had been one of the few leaders who had stood up to the communists and he now became very close to the army. He was almost a Foreign Minister in waiting, and he later became Foreign Minister under Suharto, and still later Vice President. So I talked to him and we hit it off quite well. He became a very good friend as well as a contact; and we talked about what was going on, as you do with lots of other people. You don’t go to foreign countries to sit in the embassy doing nothing but twiddling your thumbs. So I talked with this fellow at some length, and over time I discovered that he, at least, didn’t have, and perhaps the army didn’t have, a very organized collection of data on the Communist Party. Everybody knew the big names. If they could put it all together they probably all knew things individually far more than I did, but I had a kind of structure. 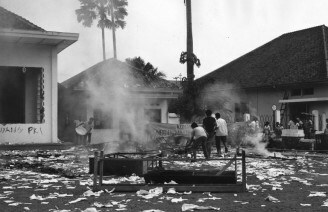 For example, the new Central Committee of the Communist Party that had been announced maybe a year or two earlier, had been in the Communist Party newspaper at that time but whether anybody had that available was problematical because fear and terror had been so great that anybody within the Indonesian system that collected information on the PKI would have been considered an enemy of Sukarno, and the state, etc. So I gave some of this basic newspaper material to him, and he took it to Malik, and Malik apparently gave it to the army. What effect it had, if any, I don’t know. It was certainly not a death list. It was a means for the non-communists that were basically fighting for their lives — remember the outcome of a life or death struggle between the communists and non-communists was still in doubt — to know the organization of the other side. To accuse me, or the embassy, of trying to murder masses of people even down to the village level, as was the accusation of that article, is about as sensible as trying to say that anybody that kept data on the Nazi Party in the late 1930s, so that Americans might be able to distinguish between Martin Bormann and Heinrich Himmler and all those people, and to discuss that with non-communist Germans, was guilty of some heinous crime. It doesn’t make any sense whatsoever. The article appeared in a good part of the American press. A young lady [Kathy Kadane] who came to me originally as a student, had been introduced to me by a State Department officer still on active duty. She was said to be interested in what had happened in Indonesia in that period. I talked to her at length a number of times on the entire history of the period, none of it on her eventual thesis. It was on the overall course of events. She seemed to be very willing to learn, very appreciative of all this. I had mentioned that, in my opinion, this contact of Malik, and perhaps the army, the non-communist Indonesians in general had been so intimidated in the earlier period that they had been afraid to develop a very good data base on the structure of the PKI — who was a member of the Central Committee, which Party officials headed which Sections of the Party structure and so on. I had given them this material which, as I say, was taken straight out of the communist press, it was all open material. So I had mentioned this point to her as an illustration of the degree of tenor leading up to the Communist coup attempt. She later became a journalist, and then came back some years later and talked to me again. She still appeared to be interested in the broader picture but she did begin to mention from time to time this particular subject which I had forgotten had been a part of our earlier conversation. It had been a one sentence aside but she now kept trying to raise it. She did so in the context of backing off whenever I wanted to return to the main subject of what had happened in Indonesia. She tried to give the appearance that she was pursuing this more general subject, but then she would occasionally slide in with a question on the side, and I’d say, “No, that isn’t right, Kathleen. You have it wrong.” Then she’d go off on some other tangent, but she tended to come back to this. Anyway, she used that as the starting point for this very negative article. Anyway, I had collected that material in a routine way. The Indonesian in question was one of two or three very good sources throughout this period for me. In fact I was doing a significant part of the embassy reporting because I’d been around longer than most of the Political Section by that time and I understood what was happening. So I had some very good contacts in that period which were very helpful…. 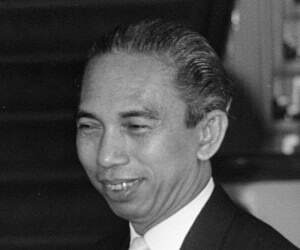 Well, Suharto had come to full power before I left, at least in reality if not totally in theory, on March 11, 1966. The government had been formed with Suharto as Prime Minister, Adam Malik as Foreign Minister and the Sultan of Djokjakarta as a third key figure. They were considered a triumvirate although Suharto was obviously first among equals. Sukarno was still nominally president, but was not allowed to do anything. It was now clear that this important country was going to go in a non-communist direction. Indonesia had rejected the communists completely. The relationship with the United States was still remote — they weren’t unfriendly with the United States, but there was practically no official contact in the transitional period. The embassy under Marshall Green’s guidance had rightfully avoided any kind of overt contact in order not to play into the hands of the communists. Suharto and Malik and the others also kept their distance for that reason because they didn’t want to support the Sukarno line that his enemies were lackeys of the imperialists. But the Suharto group was obviously going to move in a much friendlier direction.